We are still learning and challenging the capabilities of our digital tablet menus. One of the new discoveries we were able to work out has forever changed the landscape of our dessert selection. Do you remember how restaurants used to bring out the big dessert tray with mostly fake, sometimes real, exhibits of their dessert offerings for the evening? I must say, that tray always looked so darn good I had a hard time saying no. The tray is now a thing of the past. 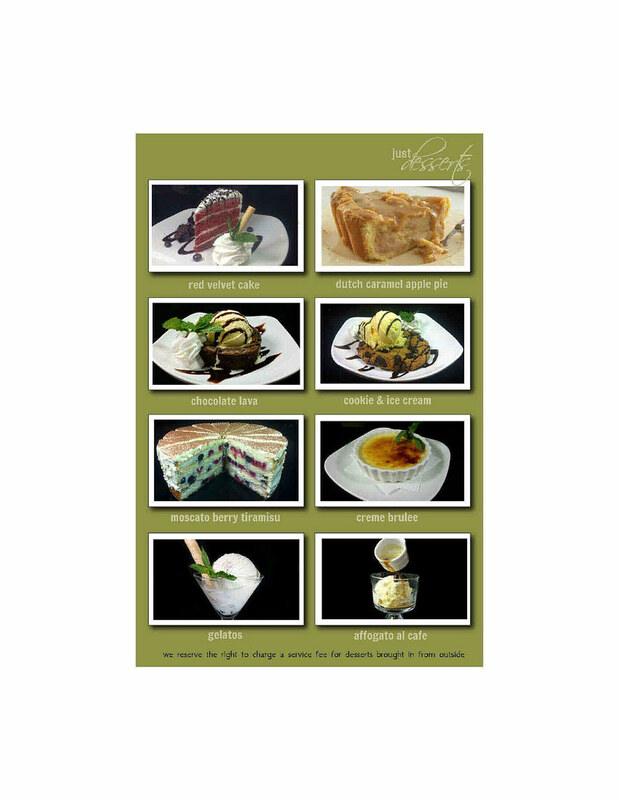 Our digital menus bring that dessert tray directly onto your tabletop. Our new layout will feature 8 revolving desserts. As we bring the dessert menu back and set it on your table, you will see all 8 images of the desserts we will be offering for the evening... enticing to say the least! They will be tough to refuse. Some staples such as creme brulee and the chocolate lava armageddon will remain, but it's time to make some changes. While we understand that customers do get used to a menu item and hate to see it go, we also believe that we can find better items to put on our menu that you may enjoy even more. Just recently, we decided to move away from ice cream and add true Italian gelato... available in vanilla bean, double dark chocolate, mint chip (my favorite), pistachio americana, salted caramel, and cappuccino. The shortbread cookie and chocolate walnut brownie will also go away and will be replaced with a new cake selection. The first on the menu, available now, is a berry moscato tiramisu. Sounds better than shortbread already! Other options soon to be seen are a traditional plain cheesecake topped with strawberry sauce and double chocolate fudge cake. We have always said, "Save room for dessert!" I think that might be a thing of the past, too. We no longer need to say it. Hungry or not, I'm not sure how you could say no after viewing the selection we've assembled. Good luck!